I cannot believe Hernando County is even considering ignoring federal ADA regulations, and worse, separating this boy and his miniature service horse. "They've done a lot more work than we were expecting. It's unbelievable the amount of work they are doing and how cost-effective it is. They've been wonderful." True, goats are great munchers, and they especially love leafy spurge. Be careful, however, that you don't put them near something you want to keep. Mine nearly destroyed a small orchard! Click on the Sioux City Journal link above for the full story on the goats who munched through the Davenport weed problem. At the Jackie Johnson clinic, Last Resort Equestrian Center. Having a great time! See highlights of Day 2 of the Jackie Johnson horse trick training clinic. Trick training with Jackie Johnson is really about communicating with your horse, enlightening regardless of your discipline. Get the equipment Jackie Johnson uses to start trick-training horses. Watch out Trigger, you've got competition! Watch out, Trigger, you've got competition! For those of you who thought this is a Belgian, try again. It's a very large Haflinger, and she turned out to be very good at the exercises we learned Saturday at the Jackie Johnson Trick Training clinic. 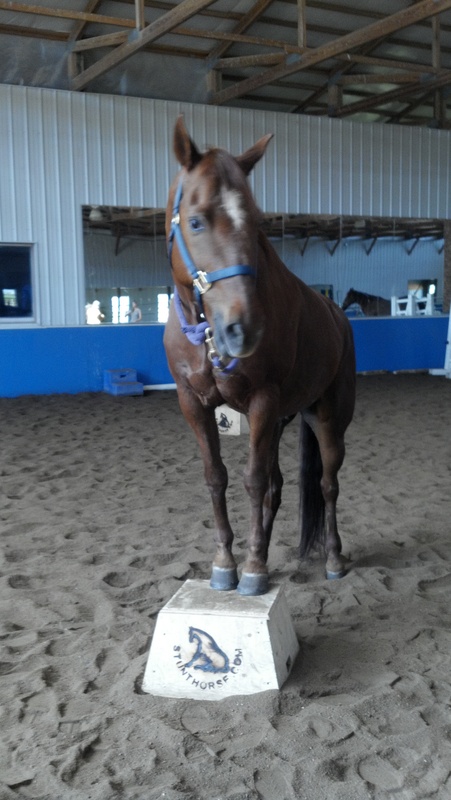 Billy got the pedestal, too! See more Jackie Johnson Trick-Training Clinic photos. To secede or not to secede is the question posed by some Northern Colorado county commissioners. Gun and oil-gas drilling limits don't exactly fall into my list of threats to "rural living", but these Weld County folks make a point: Colorado and some of its local governments pay attention to non-corporate agriculture and rural constituents only when pressed. Then growth, tax revenue, and regulations trump all. To say, "I think this is the stupidest thing I've seen in a long time ... It's hard to believe that this isn't the dumbest thing I've heard of, certainly for this year," is to say, "I no longer need those (stupid, dumb,) rural voters." Our portable, solar-powered electric goat pen from Premier 1 Fencing appears to have befuddled this little clan. I've noticed before that deer will avoid whatever area the goat pen is set up in. This only a temporary solution. Wire cages for the little cider-apple trees will be next. The Gallagher solar charger is from Jax Ranch & Home. Learn more about our hard cider-making, read Pressing on: Ye Olde Cider. A horse grazes in the background as the solar charger keeps the anti-deer fence electrified. Around here, apple trees without protective cages end up looking like this poor thing. Trees that were caged from the start (background) do much better than their uncaged counterparts. Gregg used a vise to bend 12-inch spikes from the Home Depot hardware department into sturdy stakes that keep apple tree cages in place. The apple-tree eating marauders lurk along the fence. They have trimmed the foliage on this apple tree to their height, but the tree is now old enough, decades old, that they no longer try for its bark.